Femme Fatale Records: YOU WON'T BELIEVE YOUR EYES! Here at FEMME FATALE RECORDS we are great fans of the legendary showman William Castle. Castle enhanced the experience of moviegoers with legendary effects such as PERCEPTO!, ILLUSION-O, and EMERGO! Do you wish you could experience EMERGO! for yourself? Well you’re in luck! 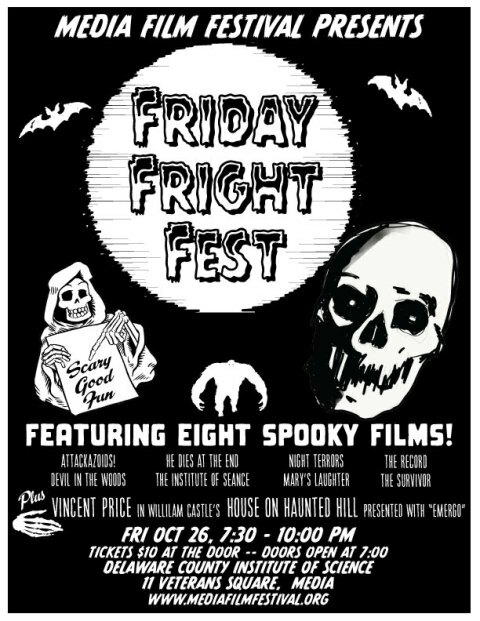 The Media Film Festival’s FRIDAY FRIGHT FEST will feature 8 spooky movies including the William Castle classic THE HOUSE ON HAUNTED HILL starring Vincent Price (we told you it was a classic) and shown with EMERGO!! For more details about the Media Film Festival’s FRIDAY FRIGHT FEST please click the following link: Friday Fright Fest! This sounds like the perfect Halloween event!